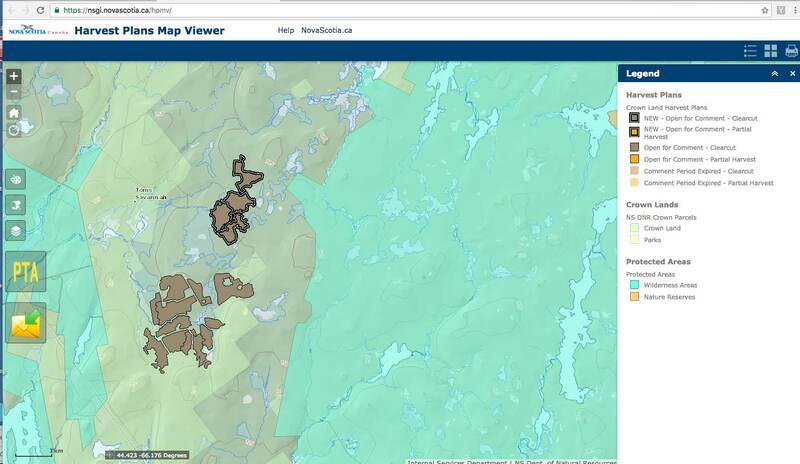 As part of Nova Scotia Department of Natural Resources (DNR) ongoing commitment to transparency, public accountability and engagement on forest harvest plans, the Harvest Plan Map Viewer (HPMV) update notifications will now include a brief summary detailing the locations, size, and harvest type for all new proposed harvest areas being added. DNR continues to improve the HPMV and has decided to add this summary of updates based upon the public’s feedback. The current notification lists data under those headings for each of 45 sections/18 DNR IDs distributed over 8 counties. The total area of harvest is given at the end (652.4 ha) and the e-mail gives the date for the next update (Dec 29, 2016).